Submit your entry, which is no longer than 300 words (without title) and features the words ‘life’ and ‘death’ below. The competition closes on 11th April 2016. All entries will be posted HERE. This is an international competition, open to everyone. Please note: You won’t receive an automated email notification after submitting your entry. I will upload it onto the site as soon as I will have the time, which might be straight away, but might be just hours later or even the next day. If I have any questions or concerns regarding your entry I will email you. Please don’t re-submit your entry, unless it doesn’t appear on the site within 48 hours after submitting it. Please don’t worry about any formatting related differences, they don’t always show properly due to technical issues. They will not affect the judging. ACE only produces a small number of hardcopy ARC’s, so having been able to acquire one is a rare opportunity and we are very fortunate to have their support. The final instalment of the Red Queen’s War trilogy promises to be incredible and this collector’s edition is well worth competing for! Furthermore, the shortlisted entries will receive feedback from the judges. Big thank you to Pen Astridge for creating the above image (based on Jason Chan’s original cover) for the contest! 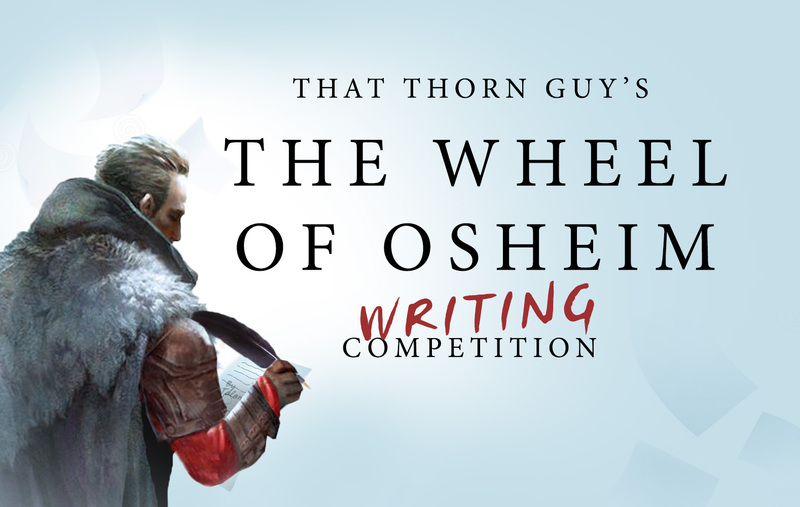 The Wheel of Osheim Writing Contest is now closed. Thank you very much for the many great submissions! The judges are currently working on putting together a short list from the best entries. In the meantime you can check out all of them HERE and do let us know if you have any favourites! Thoroughly enjoyed entering the last one. Can’t wait to get stuck into a piece for this. Thanks for what you do, Agnes! Last year I entered this competition for The Liar’s Key. I didn’t win, but I enjoyed creating Bren’s Lament for it, for which I received a lovely tweet from Conn Iggulden. I can’t wait to create something for this one now. Writing flash fiction is a great way to learn to be economical with your words when writing. Give it a shot. Now’s yours chance. And you could win an awesome ARC book to boot! Reblogged this on One More Fantasy Blog.